UPDATE: The administrative trial for Richard Haste, the officer who shot and killed Ramarley Graham, ended but it could take months for the judge to rule on any disciplinary measures. Advocates and Graham’s family are asking that we keep up the pressure for accountability. On February 2, 2012, 18-year-old unarmed Bronx resident Ramarley Graham was shot and killed in front of his grandmother and 6-year-old brother within his own home by NYPD Officer Richard Haste. Haste and several other NYPD officers broke into the family’s home without a warrant and against NYPD protocols, killed Graham, and engaged in misconduct and abuse of his family. After five years and failures by the Bronx District Attorney and US Department of Justice, none of the officers responsible for killing Graham and abusing his family have been held accountable. Haste remains a police officer in the NYPD and, despite being placed on “modified duty,” has continued to receive tens of thousands of dollars in increased pay since killing Graham. It’s this lack of accountability that allows police abuses and killings to continue in communities across the nation. This week, Haste is finally facing an NYPD administrative trial; it began on January 17 and is expected to proceed through at least January 20. Graham’s family will be there to continue their non-stop fight for accountability for the NYPD’s killing of their son and to demand that Haste and all officers responsible for his death be fired. While the media’s attention is focused on the dangerous exploits of our new president, Graham’s family and allies need our support now more than ever. 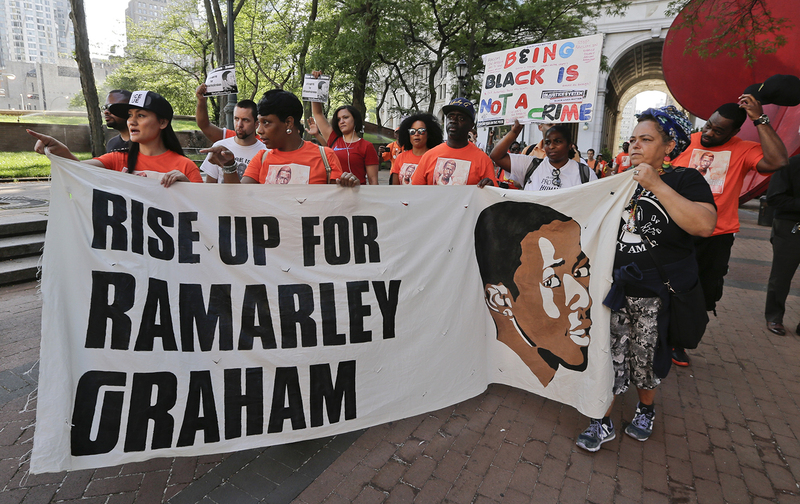 Here are three ways you can join them in demanding that the NYPD fire Haste and all the other officers responsible for Ramarley Graham’s death and the misconduct surrounding it. 1. Attend a rally in Foley Square on Thursday, February 2nd, the five-year anniversary of Ramarley Graham’s death. It could be months before a judge rules on disciplinary measures for the officer who killed Graham and in the meantime, his family needs our support. The mayor and NYPD must fire Richard Haste and ALL the officers responsible for Ramarley Graham’s killing without any further delay. That nothing has been done in five years is disrespectful to his family and makes communities less safe. 3. The Nation has joined with Communities United for Police Reform to launch a petition echoing the Graham family’s demands that all of the officers responsible for their son’s death and the misconduct related to it be fired. Sign the petition below and then be sure to share it on Facebook and Twitter. Ramarley Graham was 18-years-old, unarmed and within his family’s home when killed by NYPD officers in front of his 6-year-old brother and grandmother. Officer Richard Haste shot and killed Graham, and several other officers busted into the home without a warrant or cause and engaged in misconduct. That no officers have been held accountable five years later, but have received increased pay, is an example of the lack of police accountability that perpetuates police abuses and killings in communities across the nation. You pledged to make changes to policing that address longtime abuses faced by communities. It is time for you and your administration to demonstrate your commitment by firing Officer Richard Haste and ALL the officers involved in the killing of Ramarley Graham and misconduct related to it. It has been five years since Graham was killed. How much longer will you make the family wait for accountability from the NYPD? You will receive activism alerts and updates from The Nation magazine and Communities United for Police Reform. You may unsubscribe at any time.